Smart home products with Z-Wave inside work together, use just one app to connect and control your smart home from anywhere. Z-Wave technology is simple: the more Z-Wave products you have in your smart home, the stronger your smart home network. Z-Wave enables smart home products like locks, lights and thermostats to talk to each other. This creates the backbone of your smart home and enables you to use your smartphone or tablet to create one-touch scenes that help with daily activities like saving energy, keeping your home secure, looking after your loved ones and being more comfortable. Z-Wave products are designed to work together even as new generations of products come to market. Whether you are away for business or on holiday, or just simply at work down the street, you have full home control and access with Z-Wave. EASY to install and does not require any rewiring of your home’s current electrical. TRUSTED. The biggest brand names on the market use Z-Wave in their smart home products. AFFORDABLE. You can get started with a minimal investment and easily add more smart products. EXPERIENCED. There are already 100 million products in smart homes worldwide. RELIABLE. Having been on the market for over 10 years, Z-Wave has proven to be the top home automation solution on the market. THE SMART HOME LEADER. 9 out of 10 leading security companies use Z-Wave. SECURE. Z-Wave technology uses the same encryption as online banking making it a safe choice for your smart home. PROVIDES CHOICES. 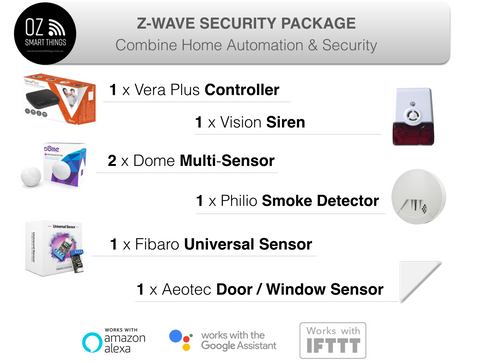 With over 2400 smart home automation products on the market, Z-Wave products provide many choices to suit your needs - styles, price points, colours, functionality, etc. Wireless connectivity for all your smart home products. No Wi-Fi interference. We have compiled the most popular products to help you start your smart home. The system can be added to at any time if you decide you want to add more products simply buy some more Z-wave devices and add them to your system. All device will work in the same system and the same app on your smartphone or tablet. 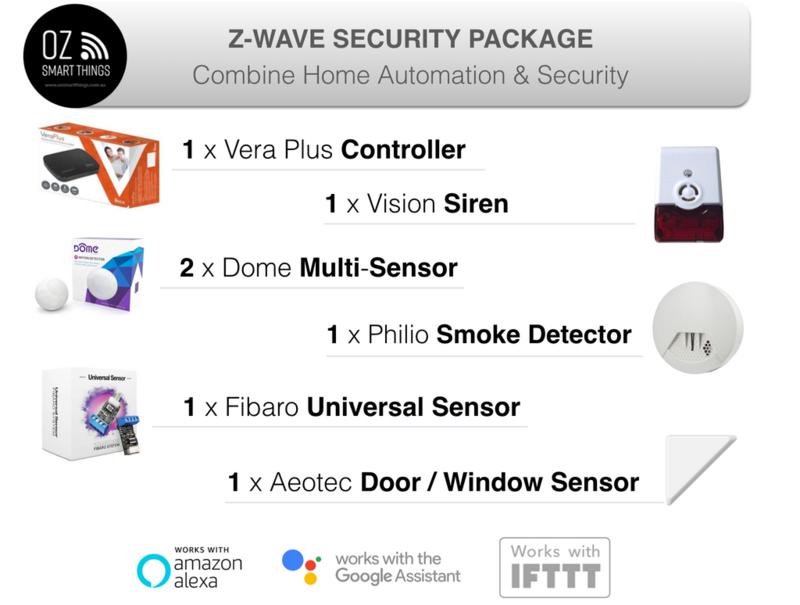 This Z-wave Security package will give you full monitoring. We have included the Universal Binary Sensor that you can use to tie into an existing alarm system check out the Blog post on how to do this.